File image of Mizoram chief minister Zoramthanga. 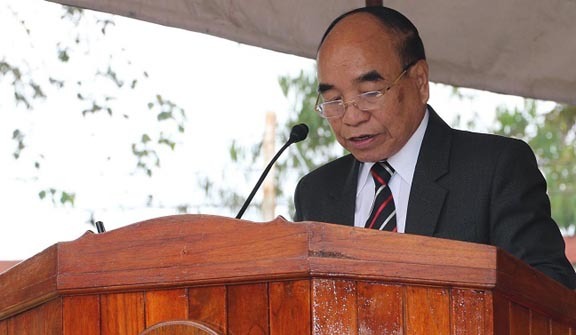 Mizoram Chief Minister Zoramthanga on Thursday said the ruling Mizo National Front (MNF) will not hesitate to snap ties with the BJP-led NDA over Citizenship (Amendment) Bill 2016. Zoramthanga was speaking about the Bill at a political rally held in Aibawk Playground, Aizawl district. “We plan to be the forerunners in protesting against this Bill and MNF is not hesitant to pull out of NDA, if necessary,” he said. The Chief Minister asserted that he had given his best efforts in the fight against the Citizenship (Amendment) Bill 2016 saying it was the main topic of discussion on his recent trip to Delhi where he met the leaders of the Central Government. “I discussed the topic with the Prime Minister but he did not have much to comment,” said Zoramthanga. He also claimed to have made a strong statement against the Bill when he met the Union Home Minister Rajnath Singh, even warning him on taking such advancements after the Peace Accord that had been signed between the Indian Government and Mizoram. “I pressurised them to the extent of saying if you are doing this to gain votes, you will not achieve anything,” said the Mizoram Chief Minister. The Home Minister called for a second meeting with Zoramthanga where they discussed the Citizenship Amendment Bill with the Central Government officials including the Secretary and Joint Secretary. It may be mentioned that the Zoram People Movement’s leader Lalduhoma on Wednesday accused the Chief Minister of being a beggar before the Central Government and said he did not believe Zoramthanga would have the courage to pull out of NDA. “We do not need to ask them to leave NDA, they should have the sense to do it,” said Lalduhoma when asked whether the ZPM party would pressurise the ruling Mizo National Front to sever its ties with the BJP.